Learn savvy credit skills now, avoid defaulting later. In 2009, when Americans were wobbling under $1 trillion in credit card debt, Congress passed the Credit Card Accountability Responsibility and Disclosure Act, a.k.a. the CARD Act, to protect Americans from the kind of financial voodoo credit card companies were including in the fine print. Along with restricting fees and limiting when rates could be increased, the law included a few points that made it trickier for anyone under 21 to open a card, requiring them to get a co-signer or show an income to justify the line of credit. The idea was to make it harder for young people with slim incomes to get into bad financial habits that would screw up their credit, and therefore their ability to take out a business loan or a mortgage later in life. It is solid logic, but a new study by the Federal Reserve Bank of Richmond and Arizona State University's W.P. Carey School of Business shows that credit cards in some forms can actually benefit young people. Analyzing data from Equifax and the New York Federal Reserve Bank Consumer Credit Panel, researchers found that while individuals under the age of 21 are slightly more likely to experience minor delinquencies (30 or 60 days past due), they are "substantially less likely to experience serious delinquency (90 days past due and longer)." Specifically, individuals age 40 to 44 are 12 percent more likely to experience a serious delinquency than someone who's just 19. "These differences are economically large considering that the share of serious delinquency in the population is less than seven percent," says the paper. One reason is that while young people might be prone to forgetting a payment for a month or two, they're also "more likely to have a parent looking over their shoulder," says Samantha Sharf in Forbes. Another may be that young people have so much student debt these days that they're more aware of credit, and less likely to allow other sources of debt to build. The results don't account for the size of the minimum payments or the size of the cardholders' other financial responsibilities. But it did conclude that young people can be less risky credit card customers than adults. While on the one hand preventing young people from opening credit cards and screwing up their credit, the rules also make it harder for them to open credit cards and start to build a healthy credit history — also necessary for attaining loans down the line. "Length of credit history is one of the biggest factors used to calculate your credit score, which lenders use to determine your credit worthiness," says Sharf. In the pre-CARD Act days someone under 21 could get a credit card on their own and begin building a credit report and credit score such that when they graduated from college they already had solid credit experience, which is helpful when getting a job, getting an apartment, or getting a car loan. 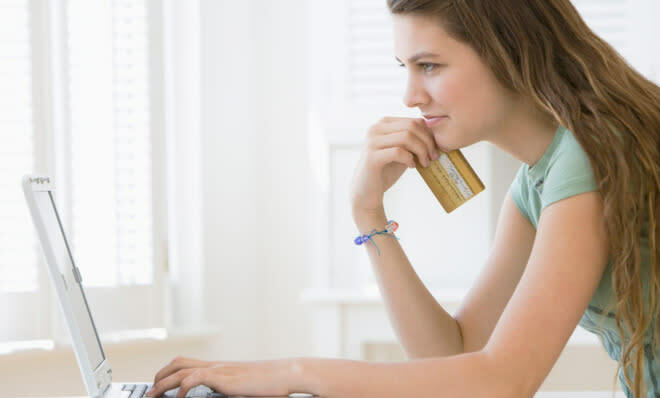 Paying a credit card on time every month takes some getting used to, so it may be wise to get the growing pains out of the way when a person is young, and their credit limit is relatively low. The study also found that a person who gets a first card at 21 is also less likely to default than a person who gets a first card at 23.